Join Camp Earth Connection for a week of fun and connection with the LGBTQ community & friends. You can stay for the week, or for a couple of days, or you can even come for a day visits. June 19-25, 2017 is LGBTQ Camping Week at Camp Earth Connection. All the cabins and campsites are available to rent on a first come first serve basis for the LGBTQ community and allies. Reserve your Cabins, Rustic Cabins, Lean-Tos and Tent Sites on via the webpage or Airbnb. All sites must be reserved for a minimum 2 night stay during the weekend. If you live locally or are lodging near by feel free to register for a day pass to the campground and all activities. There is limited availability so please e-mail to check on availability of all sites before making your reservation. Thanks! There is no charge for registration for the week or weekend, but there is a suggested donation for the weekend and for the various activities throughout the week. To register w/out payment, send an e-mail to campearthconnection@gmail.com To register with a donation, you can use paypal below, or mail your donation to: “Camp Earth Connection, 63 Hammond Hill Rd, Freeville, NY 13068. You can also make your donations during the week. All are welcome to attend activities and events; Children must be supervised by guardians at all times; Suggested donations to cover costs of activities and events are listed, but no one will be turned away. To register scroll down to bottom of page. Monday, June 19 1pm, Vegetarian/Vegan BBQ on the grill. We will have a hot grill ready and ingredients. Come join us and help us prepare Vegan and Mushroom Burgers, Coleslaw; Baked Beans, and Corn on the Cob, Melons and Something Sweet for dessert. Suggested donation: 10-15 dollars/person. Tuesday, June 20 10am-1pm, Sacred Tree Walk for all ages (bring your lunch & water bottle.) Join Susan on a walk through the woods of Camp Earth Connection and the Hammond Hill State Forest as you visit some of the fascinating and sacred trees that have lived on Hammond Hill for hundreds of years. We will stop for a lunch break during our walk. Suggested donation: 5-10 dollars. Thursday, June 22 12 Noon Campground Tour & Herstory – For day visitors (and campers) who would like to learn a little bit more about Camp Earth Connection, the Facilities, and the owner, Susan Rausch. 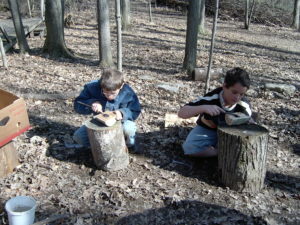 2-4pm; Woodcraft: Bowl Burning and Woodcraft for ages 6 to adults; Suggested donation: 5-10 dollars. 1-4pm Trail walk in the Hammond Hill State Forest, Participants will get a trail map and learn to navigate the trails through a guided walk. 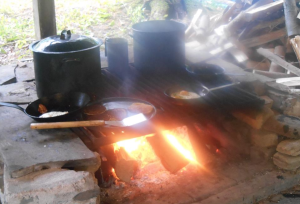 4-5pm – Fire Building and Prepare your own Foil Dinner; Learn to build a great fire from scratch and then prepare your own veggie foil dinner with all your favorite vegetables. Noon – Tostada Snack – Nothing like a hot tostada cooked over the fire with fresh salsa & guacamole! 1pm – Closing Circle – So long….till your next visit. Camp Earth Connection is excited for it’s first LGBT Camping Week, open to the Individuals, Couples, Families and Friends of the LGBTQ community. Camp Earth Connection is an alcohol and drug free Natural Campground that has a variety of accommodations for folks who have different camping needs. Since this is our first time – we could use your help. Please contact me if you have ideas or suggestions, and if you can help spread the word that would be great. The capacity this year will be for about 15 campsites and cabins, with more availability for folks who want to come during the day. There will be an activity each day, lead by Camp Earth Connection as well as some local guests presenting workshops and performing. Below is a tentative schedule for the week. Camp Earth Connection has been a children’s day camp since 2002 and a women’s retreat center since 2010. The campground is brand new, and is proud to serve the LGBTQ community and provide a safe space. Camp Earth Connection is ab0ut Diversity, Acceptance and Community. I hope you can join us on this journey to build a diverse and accepting community.